I have decided that I will reward loyal Aldi Spot subscribers every month by sponsoring a monthly Aldi Spot Subscriber giveaway. 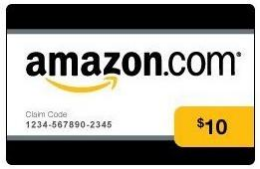 The prizes will vary every month, but this month the prize is a $10 Amazon gift certificate. Not everything can be bought at Aldi, and products such as toilet paper and diapers can often be found cheaper at Amazon. You can see a list of my latest Amazon deals here. To enter this giveaway you must be an email subscriber of The Aldi Spot. Subscribe to the Aldi Spot newsletter here. (Only activated subscribers will be eligible, so make sure to click the activation email). This giveaway will end Tuesday January 31st at 11:59 PM. I got here via twitter thru SavngMyslfSilly tweet. I got here through your email newsletter. Thanks for this opportunity! I got here today from Frugality Is Free ヅ *Thanks* for the giveaway! I got here thru Frugality is free! thanks for the giveaway! I just came across you. I found you at the Giveaway Gathering Link at Deal Seeking Mom. Today I came thru FisF. Got here by clicking on a link from frugalityisfree.com. I got to it from a link on your Frugality is free blog. Follow you on FB, but added the email newsletter so I don't miss a thing! I'm here from Frugality Is Free! Clicked here from Fabulous Finds. I found you on a TGIF linky posted by MFSAHM. Yahoo! I can use my gift card to complete a purchase. I won your Aldi snack pack drawing - this was an OCT promotion you graciously hosted. So was just stopping by to say 'thank you' and appreciate all that you post for your readers! Hope the new year is great for you! I got here from a giveaway linky on anutinanutshell! I got it from your another blog. I got here through another blog. clicked through from Deal Seeking Mom. Got it thru GFC today. I love getting my email newsletter. I got here through the newsletter link. I got here through the Aldi Spot post on facebook.